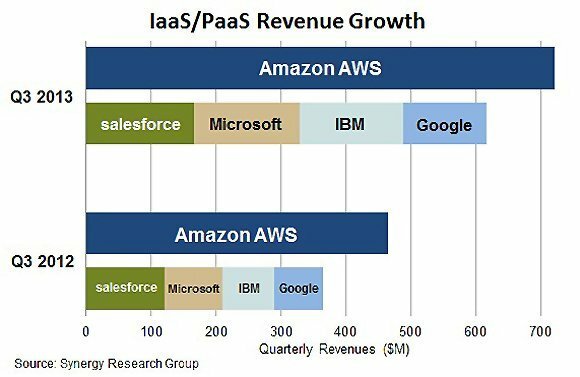 Amazon Web Services (AWS) continues to dominate the infrastructure as a service (IaaS) and platform as a service (PaaS) markets, with third quarter revenues outstripping those of main rivals Microsoft, Google, IBM and Salesforce.com combined. According to the latest figures from Synergy Research Group (SRG), although all the players have seen significant revenue growth compared with the same period last year, their share of the market remains relatively unchanged. Total IaaS/PaaS revenues in the third quarter of 2013 were $2.52bn (£1.55bn), up from $1.73bn (£1.06bn) in the same quarter last year. AWS captured 29% of the market, compared with 27% in the third quarter of 2012. Microsoft’s share grew from 5% to 7%, Google’s went from 4% to 5%, IBM’s from 5% to 6%, and Salesforce.com’s remained unchanged at 7%. “Losers included SoftLayer (acquired by IBM earlier this year), Fujitsu and a lot of telcos that have launched services but aren’t keeping pace with the market,” said John Dinsdale, managing director of SRG. Who will be AWS competition when everyone wants to be its friend? SRG believes AWS’ seemingly unassailable position is down to an early start combined with aggressive investment, innovation and pricing. “It is doing an extremely fine job of staying ahead of the market,” said Dinsdale. Microsoft, Google and IBM are all big enough to challenge Amazon’s dominance, but Dinsdale noted this would involve the IT giants making far more effort to woo customers. “They would have to decide that IaaS/PaaS is critically important to them strategically and really focus on an aggressive service roll-out combined with innovative marketing and pricing,” he said. But the idea that they might close the gap on AWS any time soon was “pretty much unthinkable”, according to the researcher. “They all have their plates full with other business issues and products that need attention. Giving IaaS/PaaS the laser focus needed to become market leaders just isn't going to happen. While they have scale on their side, they also have complex product portfolios and a ton of other stuff to deal with,” he said.